The book's bald title is a little misleading as is shown by the amount of space that's devoted to the three parts into which this book is divided. 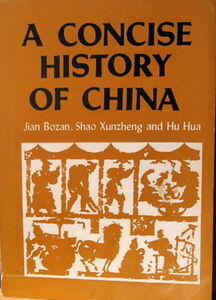 The Early Period takes in everything from the beginning up to The Opium Wars in 85 pages, The Modern Period which takes us from the Opium Wars to the founding of the Communist Party in 54 pages and then about a hundered pages from then to the establishing of the People's Republic. In other words, this is mainly a modern history from the Government's standpoint. 264 pages. Condition: Good+ Paperback. There's a small tear at the base of the spine but otherwise the cover is only slightly bumped. The front and rear end papers have some tanning and otherwise the text is clear.